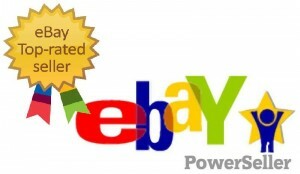 Are you a Top Rated or ebay Power Seller? When it comes to statuses within eBay and the benefits this can provide, this is where all the hard work of gaining positive feedback and 5* DSR’s comes in. There are two key upper ratings of eBay sellers, these are Power Sellers this is based on the number of items you sell, and increases from bronze to silver, to gold depending on how many items you sell. Then there’s Top Rated Sellers this is based not only on how many items you sell but the ratings you achieve in feedback from you’re buyers, this status is much harder to get than a Power Seller rating, but the benefits it provides are in turn much better too. What does it take to become a Power Seller? •	At least 100 transactions & £2,000 in sales to UK and IE buyers in the past 12 months. •	An average score on DSR’s of 4.60 or higher on all questions. Bronze is the easiest Power Seller Ranking to achieve; if you meet all the requirements above then you will become a bronze power seller. The only thing that changes each ranking is the amount of transactions & gross income achieved over three consecutive months. To become a silver power seller you will need to sell 300 items a month, and earn a minimum of £1,500 a month. To become a gold power seller you will need to sell 1,000 items a month, and earn a minimum of £6,000 a month. To become a platinum power seller you will need to sell 2,500 items a month, and earn a minimum of £15,000. To become a titanium power seller you will need to sell 5,000 items a month, and earn a minimum of £95,000. Only power sellers have the ability to become a Top Rated Sellers, once you become a Power Seller you gain benefits including Priority Customer Support & Power Seller Discussion Board. Once you become a Top Rated Seller, it is then that you’re Power Seller Level truly comes into play. When you become a Top Rated Seller, Bronze & Silver Power Sellers you will receive a 10% discount on you’re final fees. When you are a Top Rated Seller, and a Gold or Platinum Power Seller, you will receive 15% discount on you’re final fees. When you are a Top Rated Seller & Titanium Power Seller, you will receive a 20% discount on you’re final fees. Wow, this is Wow, this is totally ueiralnstic. Running a website is very hard work. I if you spend 30k just to get your site on-line, you got ripped of big time. I own and run a website, so I know. and for gagandah90 I dont know what your talking about because you cant just turn off a website. Thats insane, if you did that google, yahoo, msn and any other note worthy search engine would ever index your site. « Fantastic start to our Brokerage deals!